And don't forget to check out our great varieties of Standard Feeds, Elite Specialtiesand Suet products! 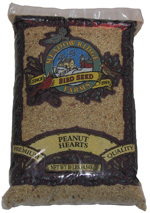 Cardinals and many other wild birds will love Meadow Ridge Farms Premium Cardinal Mix! With twice the amount of Black Sunflower and Safflower than the Premium Wild Bird Mix, it provides and even more energy rich source of feed and a higher quality blend that bird lovers will appreciate. This is a popular bird feed for beginners and experts alike. Tray or Platform feeder, Open port tube feeder, Large covered fly through feeders. To attract more cardinals, use feeders without cages or smaller fly through feeders. • Sizes: 36lb, 17lb, 10lb, 5lb. 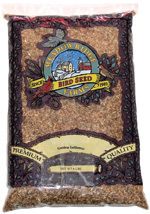 Meadow Ridge Farms Premium Wild Bird Mix is a select mix of high quality feed. Compared to the standard Wild Bird Mix, it contains 20% more Black Sunflower and 10% more Safflower that birds and customers love. It fits in a price point between the Wild Bird Mix and the Deluxe Cardinal Mix and is price protected to ensure higher margins. Cardinals, Grosbeaks, Junco, Indigo Bunting, Mourning Doves Sparrows, and many more. • Sizes: 50lb, 17lb, 10lb, 5lb. 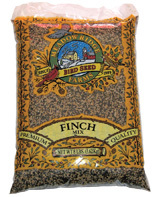 Our Finch Mix is a special blend designed to meet the dietary needs of all kinds of finches. This is a blend typically used in the spring and summer months when finches are in the area and active. The 8lb bags are the most popular. • Sizes: 50lb, 25lb, 8lb. Meadow Ridge Farms Nyjer Thistle is a popular feed for finch enthusiasts. Not actually a thistle, this seed is unrelated to the native noxious weed and is sterilized so it will not sprout. This is one of our many seeds that is very popular with the more adventurous birders. • Sizes: 50lb, 25lb, 8 lb. 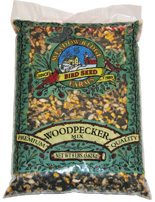 Meadow Ridge Farms Woodpecker Mix is a fabulous mix of fruits and nuts that woodpeckers and many other birds love. This is a true specialty mix that from which retailers can expect high margins. 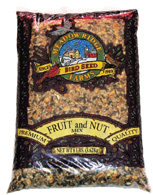 Fruit and Nut Mix is a fun mix for attracting birds and other wildlife. The alluring combination of sweet smelling fruit and protein filled nuts is bound to be attractive to many birds as well as squirrels, other small critters and customers. 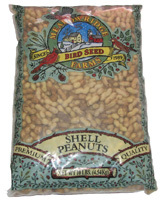 Peanuts in the Shell are a great and entertaining way to attract many birds to your yard. It is a great straight feed option to sell because it is visually attractive and specific to certain wildlife. It is very beneficial to sell alongside any feeders specifically designed for peanuts in the shell. • Sizes: 15lb, 10lb, 5lb. Peanut Parts are a nutritious feed that are high in oils and proteins. Almost all birds and people will be attracted to the smell of peanuts. This is a great feed to carry, as many people like to use it in homemade blends. This is most populare in its 8lb size. • Sizes: 50lb, 25lb, 10lb. Peanut Hearts are a tantalizing feed for many birds. The aroma will attract many birds and the small sized pieces are easier for many small birds to eat. This is a great supplement for other seed blends or as a straight feed. 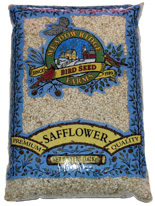 Not only is Safflower a nutritious, high energy bird feed, but squirrels tend not to like it and birds like starlings and grackles don’t have beaks strong enough to crack the shell. It’s an easy sell because it attracts many song birds, without inviting their less attractive feathered-friends. • Sizes: 50 lb, 25lb, 8lb. Golden Safflower is newer to the market and is an improved version of the familiar white safflower. It has higher protein and oil content and its hull is thinner and easier for birds to crack. Many trials have proven that most birds prefer the golden variety over the usual white. The thinner hulls also make less of a mess around feeders. 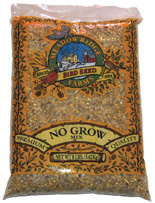 Meadow Ridge Farms No Grow Mix is designed to feed the birds a nutritious mix while leaving behind less of a mess and sprouting seeds. This is a popular mix for people who incorporate their bird watching into their lawn and garden areas. No Grow Mix is one of the best sellers during the growing season. Sunflower hearts are a fantastic no-grow option for bird feed. They provide the same nutrition as the whole black oil sunflower seeds, but they don’t leave the mess under the feeder. This is a great offering for customers who enjoy mixing their own feed. • Sizes: 50lb, 25 lb, 10lb, 5lb. Attract deer to the yard by providing a delicious mix for them to eat. Watch these elegant animals as they come to snack in your yard. Providing Deer Mix may also help to lure them away from plant life you would like them not to eat.